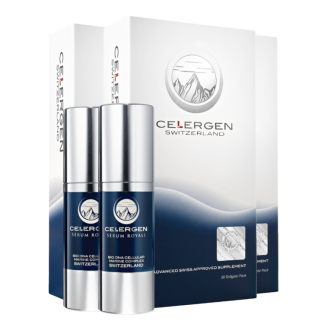 Clinical studies show that the key ingredients in Celergen actively work to reduce lines, wrinkles and crows feet, while hydrating and strengthening your skin for a healthier, beautiful appearance. Made up of the 2 main components of outer skin layers, collagen and elastin – one of Celergen’s key ingredients – Peptide E Collagen is easily absorbed while lifting and toning slack areas, hydrates and thickens, and reduces lines, wrinkles and roughness. Peptide E Collagen was given orally for 28 days to study the effect on forearm wrinkles and crows feet in 43 healthy female volunteers aged 40-55 years and compared to a control (non-treated) group. At 28 days, 71% of subjects in the Peptide E Collagen group showed a significant decrease in the number of deep wrinkles as compared to the control group which saw an increase in deep wrinkles. Fibroblasts are critical in the support of normal wound healing. They are a type of cell that is responsible for making the extracellular matrix and collagen. Together, this extracellular matrix and collagen form the structural framework of human skin tissue and play an important role in tissue repair. To establish if Celergen would quali-quantitatively implement natural cell recovery in non-toxic wound healing, cultures were treated with Celergen for 24 hours as compared to an untreated control. 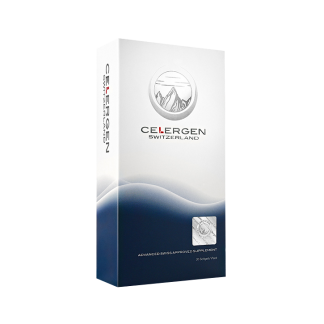 Celergen treated fibroblasts significantly induce a whole range of biochemical events involved in the wound healing process, including cell proliferation and secretion of collagen – increasing skin tissue recovery.